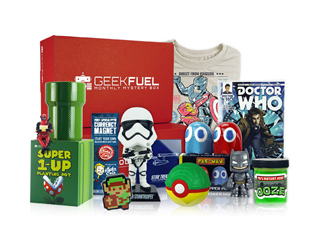 Mashable, IGN, and Digg know what geeks like-which is why they've all featured the Geek Fuel Mega Pack. And what's not to love about it? Especially right now, when it's 64% off at Escapist Deals. Escapist readers will get four Geek Fuel boxes-one exclusive Welcome box, plus another box each month for the next three months. The gist of Geek Fuel is this: a box packed full of awesome stuff, delivered right to your door. We're talking exclusive tees, full downloadable games, toys, comics, collectibles, and more-plus, the latest issue of Geek Fuel Magazine. It's everything you need to have the latest and greatest from Star Wars, Avengers, Doctor Who, Super Mario Bros, and more. Get your geek on. Get four boxes from Geek Fuel for 64% off at Escapist Deals.